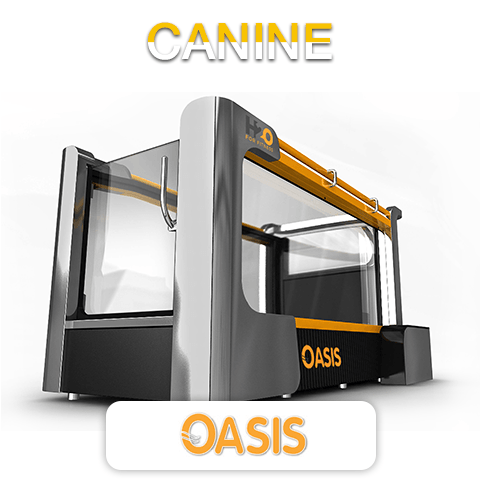 Underwater Treadmill for Dogs – The Oasis H2O For Fitness is proudly presenting The Oasis – the latest underwater treadmill for dogs. The Oasis is the premier offering in the field of rehabilitation through Hydrotherapy. Along with rehab, the Oasis can also be used for fitness training and weight control. Along with canines, the Oasis is ideal for other small animals/ pets. The natural buoyancy of water assists in a low impact but high intensity work out. This is especially important in cases of patients in recovery mode. With adjustable water temperature and water level, the Oasis makes rehab, fitness training or weight control, a relaxing experience. The Mirage is a brand new offering in the field of rehabilitation through hydrotherapy. Along with rehab, the Mirage can also be used for fitness training and weight control. The natural buoyancy of water assists in a low impact but high intensity work out. This is especially important in cases of patients in recovery mode. With adjustable water temperature and water level, the Mirage makes rehab, fitness training or weight control, a relaxing experience. From people to pets and physical therapy to vets, we have an H2O product designed with your specific needs in mind. Our products are designed keeping the customer in mind, suiting both the aesthetic and the practical. The most competitively prices underwater treadmills on the market. Although our products have the most competitive prices, our work culture demands that quality remains our top priority. Easily access underneath the treadmill belt for thorough cleaning. Round the clock support, literally! Go ahead, call any of our customers and see what they say! You do not have to go through an ‘Underwater Treadmill 101’ course to learn how to use our products! On-site training is provided at the time of installation. The design team of H2O For Fitness focuses on keeping it simple yet functional. That is what helps us keep our prices affordable to our customers. Water has a natural property called ‘buoyancy’. Hydrotherapy uses this property of water to its maximum potential and provides a low impact, soothing workout to patients. Hydrotherapy is defined as ‘the use of water to achieve therapeutic benefit and relaxation’. Formerly known as hydropathy, it involves the use of water for pain-relief and treating illness. Come visit us in booth #4245 at the WVC in Las Vegas at the Mandalay Bay to see the Oasis in action!